The supernatural storm of the century is coming. Leda’s quest to gain the magic she needs to save her brother leads her to the castle of the Dragons, home of four soldiers in the Legion of Angels with extraordinary powers over the elements. If she makes it through their training, she might just survive her next sip of the gods’ Nectar and level up her magic. But the gods’ gifts of magic come at a price. Leda can already feel the Nectar changing her, making her less human—and so is her budding romance with the angel Nero. Sip by sip, kiss by kiss, the change is taking hold of her. As if that’s not enough, Leda finds herself once again caught between the armies of heaven and hell—and tempted by a darkness that threatens to consume the Earth. 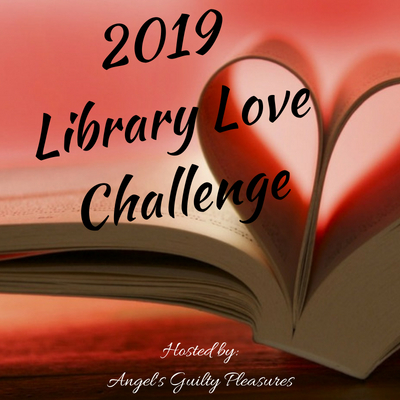 I’m hooked on the Legion of Angels series. I get to the end of the book and all I want is more, so I pick up the next available title. 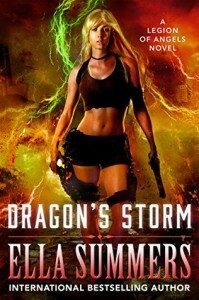 Dragon’s Storm is book four in the Legion of Angels series by Ella Summers. Their where a lot of great developments and surprises in Dragon’s Storm. Leda is currently at Storm Castle for training on the four elements; earth, air, fire, & water. Despite the fallout with Nero in the last book, he seeks Leda out for help on another mission to find one of the storm dragons who’s gone missing. These two fight and work well together. I like seeing them on missions and off. In Dragon’s Storm Leda is indecisive on having a relationship with an angel, Nero. Their is a lot of tension between them as they work together. She has to decide if she could accept Nero for who he is, a man and an angel. She also has to realize that she has always acted this way and that the powers she gains, don’t change the person she has become. We get a little more on the Guardians, but not much. We get to learn more on Nero’s mother and Leda’s brother Zane. Lots of surprise throughout this book and at the end we have BIG surprise that will shock. This series packs a punch. I love the action and romance. Like getting hit with surprises in each book, going on a mission, and gaining more powers. Urban Fantasy fans will enjoy!